When Tyson Fury upset long – reigning champion, Wladimir Klitschko last November to win the lineal heavyweight championship, it immediately injected new life into a division in need of life. Okay, so it wasn’t exactly George Foreman taking Joe Frazier’s lunch money or Larry Holmes and Ken Norton beating each other up with the rusted links of the evolutionary chain. It was more like the first microbes that crawled from the primordial ooze of the earth’s beginnings. Nothing exciting, I’d assume but it was a start and that always leads to somewhere, even if it takes the craziest route, which is exactly what happened. First, Fury was stripped of his IBF title for signing for a rematch against Klitschko instead of mandatory challenger Vyacheslav Glazkov which given boxing politics, is no surprise. This development put a halt to what would have been an intriguing match – up between Charles Martin and Dominic Breazeale, both undefeated American heavyweights, when Martin was offered to face Glazkov for the vacant IBF title. The momentum we’d all been craving was upon us. But like I said, some crazy things can happen during the struggle to evolve. Life is often painful, with multiple starts and stops. First, Californian Gerald Washington was set to face Colombian Olympian Oscar Rivas. We knew that Washington was flawed (as evidenced by his struggle against a tough but 43 year-old, Amir Mansour) and we didn’t know much about Rivas, save for some predictable blowouts of limited opposition and that a short, powerful heavyweight is always going to remind us of the most menacing lisped man to ever walk the earth. But a battle between two, undefeated big men are always going to pique the public’s interest and we wanted to see what would happen. As it turned out, nothing happened because Rivas couldn’t see, out of one eye it seemed and he was declared unfit to fight by the California State Athletic Commission due to a failed eye exam. Bummer. But at least Martin and Glazkov were going to get it on. Decent fight, might iron out some questions. We knew that Glazkov was solid but unspectacular, two close calls against Tomasz Adamek and Steve Cunningham that could have gone either way. But we didn’t know anything about this Martin guy at all, except that he’s got dreadlocks and that he’s a southpaw. He was such an unknown commodity, in fact, that even in this era of cell phone cameras, cams and drones, any video of him is rarer than that of Bigfoot and almost as blurry. But if he could blast Glazkov out of there, then maybe he was that “sleeper” that every division seems to have, right? We didn’t get to find out. After two and a half rounds of feeling each other out, Glazkov blew out his knee and we found ourselves even further away from knowing the real identity of Charles Martin. The momentum we’d been craving was slipping away. But thankfully, the two steps that we took back are only priming us for that big leap forward, that moment when we finally crawl out of the water and up onto land. 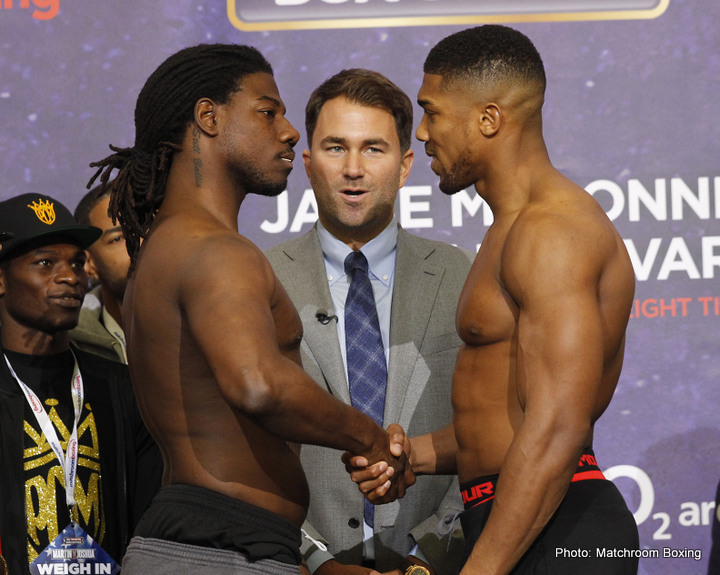 Tomorrow night at the O2 Arena in London, Charles Martin defends the IBF belt he won under dubious circumstances against Anthony Joshua, the man who secured his title shot under dubious circumstances. The money is on the muscle – bound Brit to win and he should win. But the way things have been going lately, I’m not discounting anything. “Prince” Martin has nothing to lose, he sounds legitimately confident and he likes to throw that left hand with heat. If he gets the challenger’s respect early, things could get very interesting, providing a nice segue way into next month when the mandatory position for the winner’s title will be contested between hot prospect Joseph Parker of New Zealand and the durable Carlos Takam. On the same day Deontay Wilder will face the toughest test of his career against Alexander Povetkin in Russia. A month after that, Fury and Klitschko will do it again, the most tantalizing aspect being that the victor must next face the dangerous Ortiz. It appears that all the components for life in the heavyweight division are finding their place. From a quagmire of nothing to swimming to crawling, the big men are walking again and with a little luck will soon be off and running.